IIFT 2019 - IIFT has released the online scorecard of IIFT 2019 on January 24, 2019. The list of shortlisted candidates was declared on January 15, 2019. A total of 2097 candidates has been shortlisted for the selection rounds which include Essay Writing, Group Discussion and Personal Interview rounds. The paper-based (offline) exam was conducted on December 2, 2018. Indian Institute of Foreign Trade (IIFT) conducts its national-level entrance exam i.e. IIFT entrance exam, for admission to its MBA programmes at its Delhi, Kolkata and Kakinada campuses. IIFT 2019 entrance exam was a paper pencil based objective-type test carrying 114 multiple-choice questions (MCQs). The duration of the exam was 2 hours. The exam was conducted in 20 cities in India. The exam is the gateway to IIFT’s two-year fully-residential MBA in International Business (IB) programme. The final selection at IIFT will be made on the basis of Entrance test score, Group Discussion (GD), Writing Skill Assessment and Personal Interview. In this article, candidates can check all the information about IIFT 2019 entrance exam such as important dates, eligibility, application form, admit card, exam pattern, answer key, result, cutoff, etc. Shanti Business School , Admissions open 2019. Scholarships Available. IIFT 2019 was conducted on December 2, 2018. The result is expected to be declared in the last week of December or first week of January. The following table provides the important dates of IIFT 2019. According to the test takers, the overall difficulty level of the exam was tough. Logical Reasoning was the toughest section followed by Quantitative Ability and Data Interpretation. The difficulty level of Reading Comprehension and Verbal Ability was moderate. GK was of easy to moderate level of difficulty. The experts from different coaching institutes will be analysing the IIFT 2019 exam after the test is conducted in the first week of December. The exam analysis of IIFT 2019 will allow the candidates to get an overview of the overall difficulty level of the exam and it’ll also allow them to estimate their score. The answer key of IIFT 2019 will be available soon as the exam is conducted on December 2, 2018. Several MBA coaching institutes such as T.I.M.E, HitBullsEye, Career launcher and IMS will release the answer key. The IIFT 2019 answer key will allow the candidates to check the answers to the questions asked in exam and they will be able to calculate their estimated scores and accordingly, they would be able to prepare for the further rounds of the selection process such as Personal Interview, Written Ability Test or Group Discussion. The result of IIFT 2019 has been announced on January 15, 2019, and the scorecard has been released on January 24. Candidates can download their IIFT 2019 result/scorecard from the official website of the institute. The institute has shortlisted 2097 candidates for the selection rounds - Essay Writing, GD and PI. For female candidates who have cleared all the sectional cut-offs, the minimum marks have been lowered down by 2%. The shortlisted candidates will be appearing for PI, WAT and GD rounds. Candidates can check their individual score in each section by logging in to the official website with their Roll No. and DOB. The previous year, over 1900 candidates were shortlisted for the selection rounds. The IIFT 2019 Scorecard is valid till November 30, 2019. As the result/scorecard of IIFT 2019 has been announced, the selection procedure of IIFT 2019 will begin now. The shortlisted candidates will be called for essay writing, interview rounds and group discussion among others. The IIFT selection procedure 2019 will take place in January-February 2019. Around 60,000 students appeared for the exam this year. The selection procedure will be held across major states including, Chennai, Bengaluru, Delhi, Lucknow, Hyderabad, Kolkata and Mumbai. The exam had 114 Multiple Choice Questions (MCQs) divided into six sections. Each question had four options. Candidates had to select the right answer. The marking scheme for each section would be different. The duration of the exam was 2 hours (120 minutes). The following table shows the previous year’s exam pattern and it’s expected to be more or less the same this year. Marking Scheme – As mentioned in the table, the marking scheme was different for each section. There was negative marking also for wrong questions. A certain percentage of marks from the total marks allotted to a question will be deducted for each incorrect answer. Candidates who are planning to apply for the exam must know the syllabus of IIFT 2019. It’ll help them prepare for the exam more specifically. The following table gives a brief of the IIFT 2019 syllabus. Comparisons, Directions, Coding-Decoding, Deductions, Input & Output etc. Bar Graph, Pie Chart, Table, Line Graph etc. Grammar, Analogy, Spellings, Phrases, Synonyms, Antonyms, etc. Numbers, Geometry, Mensuration, Permutation & Combination etc. Politics, Business, Economics, Banking, History, Geography, Sports etc. Candidates must have a recognised bachelor’s degree of minimum three years duration. Final year graduation students are eligible to apply for IIFT 2019. However, they would need to provide proof of that particular semester. Age Limit - There is no age limit for candidates to apply for the IIFT exam. Candidates were able to fill the application form of IIFT 2019 from August 6, 2018. The IIFT 2019 application form could be filled in online mode only. The application process had been extended until September 24, 2018. Candidates were advised to fill the details such as personal, academic and contact information correctly while filling the application form of IIFT 2019. Candidates who chose to fill the application form online could pay the application fee online through debit/credit card. The application fee was Rs. 1650 for the General category candidates and Rs. 825 for SC/ST and Physically handicapped candidates. 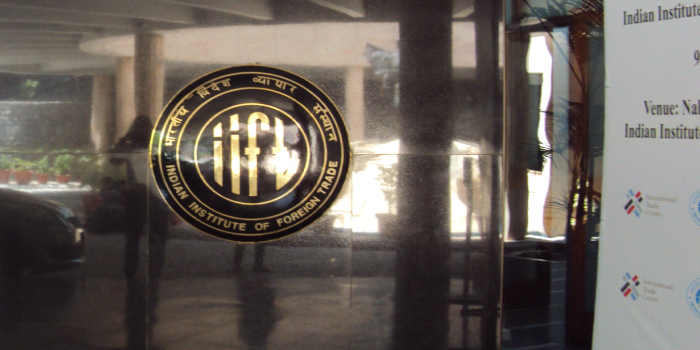 The IIFT application fee 2019 had increased from that of last year. Foreign nationals who applied for the exam under the self-financing scheme needed to route their application through the Ministry of External Affairs/Ministry of HRD, Govt. of India. These candidates needed to send their application to the Institute latest by February 15, 2018, along with the valid GMAT score. Your IIFT brochure has been successfully mailed to your registered email id .